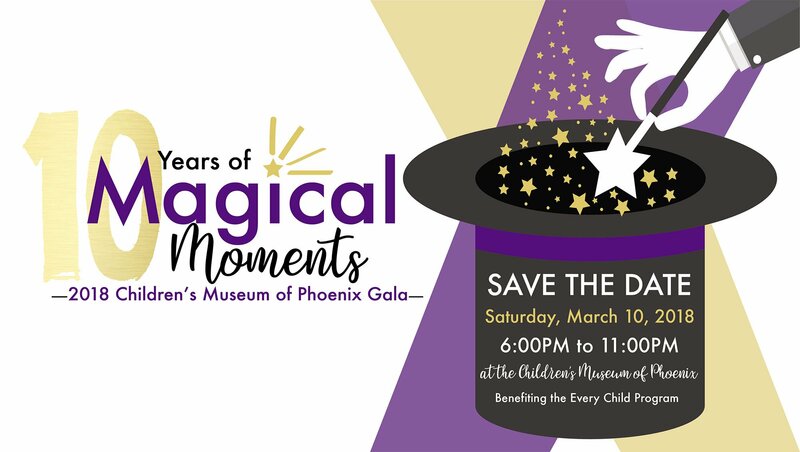 The 2018 Children’s Museum Gala takes place at the Children’s Museum of Phoenix — the perfect setting for a night of playful fun! The Museum is housed in the historic Monroe School Building on the SE corner of 7th Street and Van Buren and is the perfect setting for a night of playful fun! This $275 per ticket event will bring you magical encounters and wondrous surprises while kicking off the Museum 10th Birthday Celebration, marking 10 years of bringing joyful learning to children and their families throughout the Valley. Festivities begin at 6pm with a cocktail party offering an array of delicious hors d’oeuvres prepared by some of the Valley’s hottest chefs, magical entertainment and an exciting silent auction. You won’t want to miss participating in Hocus Pocus Focus and Magic Bingo during this part of the event. Then, guests take a seat under the stars for a sumptuous sit-down dinner, entertainment, live auction and a celebration of our amazing Kids at Heart Award recipients. The evening culminates in after-dinner drinks and dancing. Proceeds from this event directly benefit the Museum’s Every Child Program which provides free or reduced rate Museum access to families battling financial, emotional or circumstantial challenges.